Pin it! How to avoid wrist pain in yoga. Ok I know this little graphic looks like a game of Twister, but bear with me. I tried arrows at first but it was too messy. 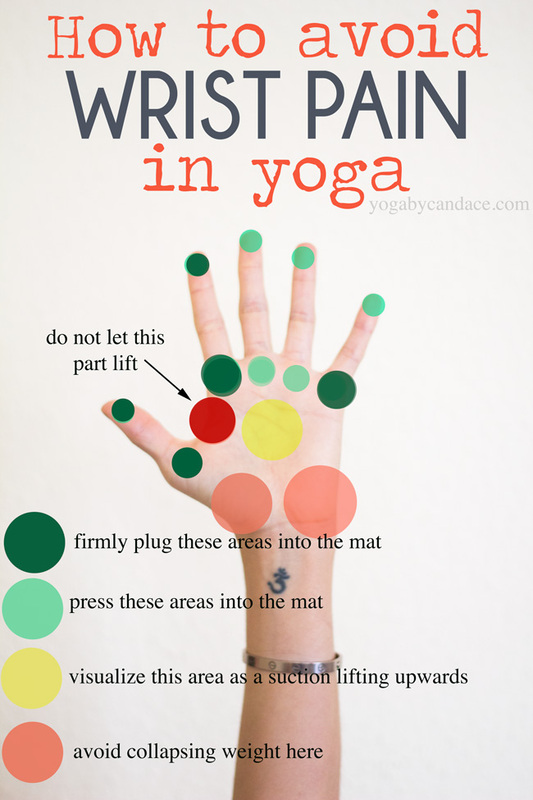 Wrist pain is easily the most common complaint I hear in yoga class, and it's understandable. The hands have so many tiny, underdeveloped muscles that tire easily, making us want to collapse into the base of the hands (the orange circle areas) to give the little muscles a rest. The problem with collapsing into this area is that it can really hurt the wrists. To be clear, the entire hand should be on the mat, but you want to press especially hard into the dark green areas. Doing that will cause a subtle suction in the center of the palm which will engage and build strength in all the little muscles in the forearms. TIP: If the red circle area is beginning to lift, this means the body weight is collapsing into the orange area or side of the hand which you don't want. If it's too much on the hands to bring the focus back into the dark green and light green areas, then either modify the pose or come into child's pose for a rest. PS- Focusing on developing the hands in other poses like this may also help. Let's talk The Yoga Forum has just launched! Come join and chat with other like-minded people about everything from chaturanga to chocolate.